Mozart thought of himself as a composer of opera above all. 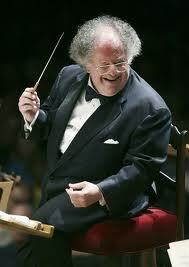 So too does conductor James Levine in a masterful new recording of five Mozart symphonies. Just released on the house label of the Boston Symphony Orchestra, these are five compelling essays in lyric and aria, all without words and all premised on song. They were recorded live at Boston Symphony Hall in February 2009, and released on 21 July this year. They are worth the wait. A general appreciation: the Boston Symphony plays with glorious intonation. Levine at The Met famously has an ear for such things. As music director, he has brought his pitch sensitivity to Boston, and this is one of the rewards to be found here. The matching of pitch from section to section in the orchestra, and across the performance, is truly admirable. And a specific: Levine has the gift of pulse. In his hands nothing fast ever sounds rushed, nor slow sounds torpid. He has, like Mackerras and Kleiber, a gift of pulse that renews itself without forcing. In music of the Classical era, this is essential. In this music, allusions to dance and topic are everywhere. The formalities count. And in all, key and key relationships lie at the heart of musical architecture. In this recording, Boston gets it right. They begin with Symphony No. 14, from 1771. Levine uses a harpsichord in the continuo, a wise nod to informed performance practice. Although all five symphonies are played at modern pitch, efforts are made to honour original articulation and ornament. The second movement, Andante, is elegant and lithe, with modest ritards given before each reprise. The third movement declares Mozart’s admiration for CPE Bach, and the shocks and starts of the Rococo. His strange and biting modulations are given weight here, but are never self-regarding. Symphony No. 18 follows, dated from 1772, and – so typical of Mozart – is already years beyond in formal and technical maturity. Levine doesn’t belabour the point, but simply allows the work to play itself. Lesser or more self-important conductors would linger, staring in the mirror. Levine lets Mozart be Mozart. Notable is the unusual pairing of two flutes and four French horns. Even more so is the tremendously virtuosic horn writing, here played flawlessly by principal James Sommerville and his colleagues. Although the Boston players use modern valve horns, they convey the energy and risk of the original natural horns. They make a good bargain. Also dating from 1722 is Symphony No. 20 -- among the most vocally-oriented of his concert works. Mozart is gaining mastery of orchestration, of blend and balance, and of voicing. Elizabeth Ostling’s flute solo in the Andante is a marvel of eloquence. Levine does not shy from comparisons to Haydn. As the late Michael Steinberg writes in the CD liner notes, Mozart was now almost certainly influenced by the great master at Esterhazy, and here took as his model Haydn’s Symphony No. 42. No wonder. The good humour and propulsive energy of each is an inspired kinship. Something astonishing happened at Vienna from June to August in 1788. Mozart composed his three last symphonies. All are miracles of structure and energy. Two are on this CD. No. 39, completed on 26 June, was the first occasion on which he included clarinets. It was one of only three occasions he employed the grand device of the slow Introduction. No. 39 is a compendium of everything Mozart knew about the orchestra. 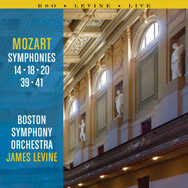 It is daring in its dissonance, and now Levine and Boston and their superb intonation give us so much. Lazy orchestras drift in a cloud of pseudo-dissonance, pitch never being absolutely precise. Not here. The cutting edges are all the more fierce and real for their exactness. So too are the rolling syncopations. Levine shows us that it is possible to be exact without being mechanical. This double-CD set ends, rightly enough, with the mighty Jupiter, No. 41 in C Major. In some ways this work lives in the rear view mirror. It is a summary of earlier polyphonic styles, formal design, brief utterance and a perfect concision. The work is in no way valedictory, but it is impossible to overlook its place in the composer’s life. Like The Tempest, the fact of standing at the end of a great line cannot be overcome. Levine is aware of this history, but conveys the work without false sentiment, and without regret. Its surprises are left intact, its jokes never heard before, and its sly allusions played straight. It is this honest play that does Mozart such great service.